At this time of year we’re always plagued by many mosquitoes and bugs, particularly in the evening (much to the cats’ delight). In an effort to relieve us from the constant buzzing, I decided to turn some old candles into citronella candles in jars. 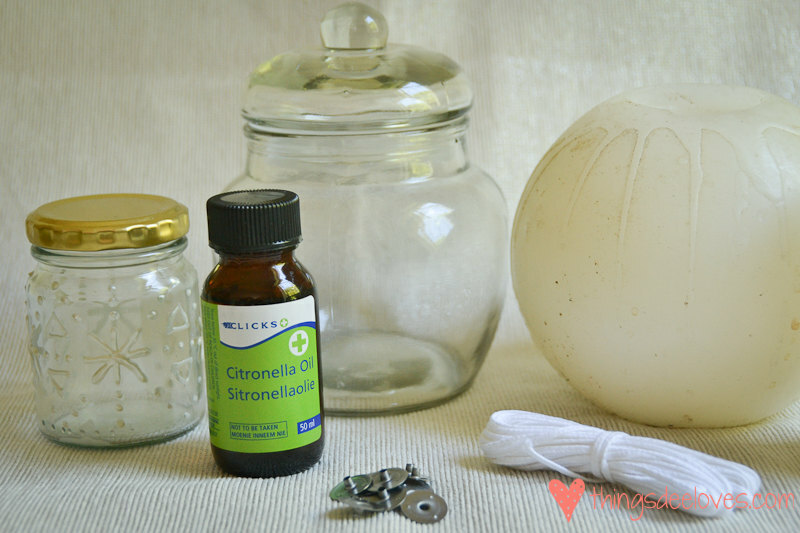 Citronella isn’t for everyone, but I’ve grown quite fond of the smell. I also used proper citronella oil, which smells much better than the synthetic (and often overpowering) commerical citronella candles. 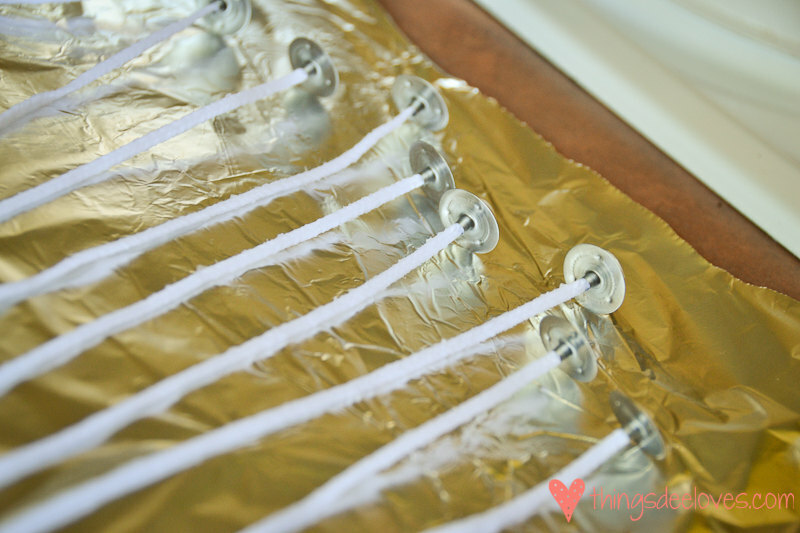 This is a great way to use up any old and dusty candles lying around the house. 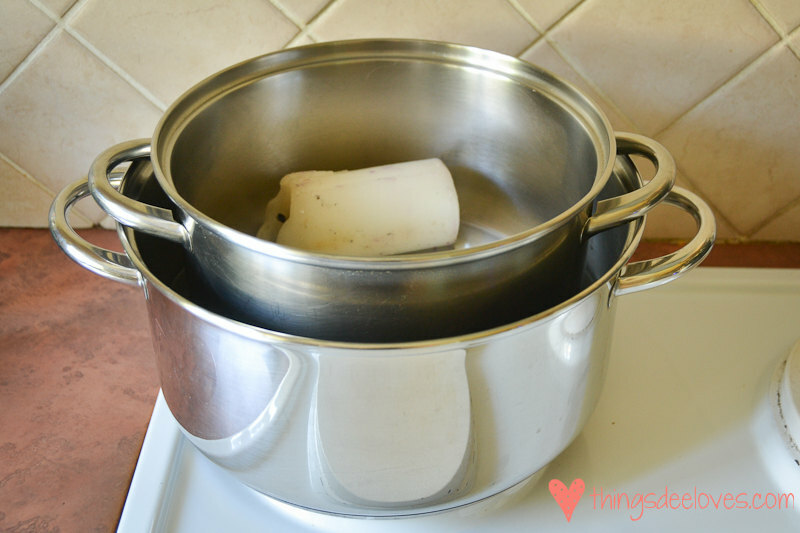 Set up your two pots on the stove to form a double boiler. Add some boiling water to the bottom pot so that it covers the bottom and the sides of the smaller pot, and set it to simmer (not boiling). Add your first candle, and stir while it melts. In the meantime, cut your wick into lengths to fit into your jars (leave a few centimetres at the top). Secure the wick into a sustainer with a bit of prestick. 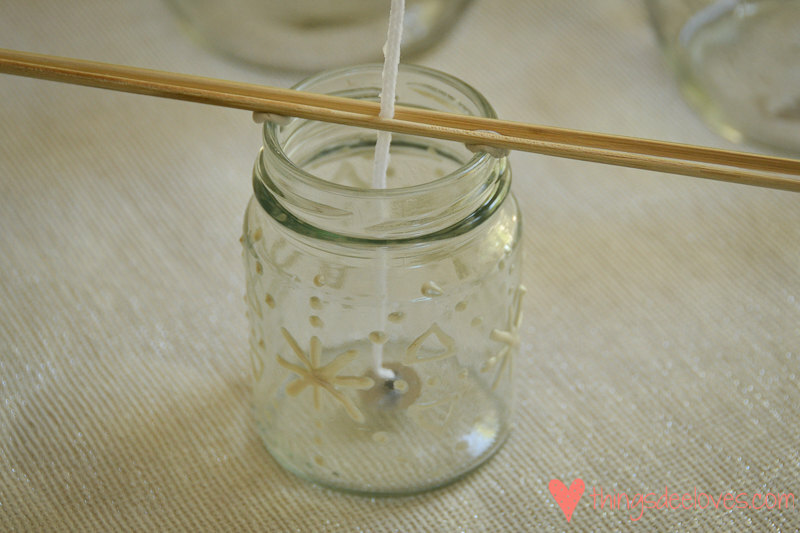 Once you have enough wick cut for all your jars, dip each wick into the melted wax and set aside to dry. Once the wicks are dry, stick each sustainer into the bottom of each jar, and secure the wick above the jar using some kebab sticks. The was can take some time to melt, so be patient. 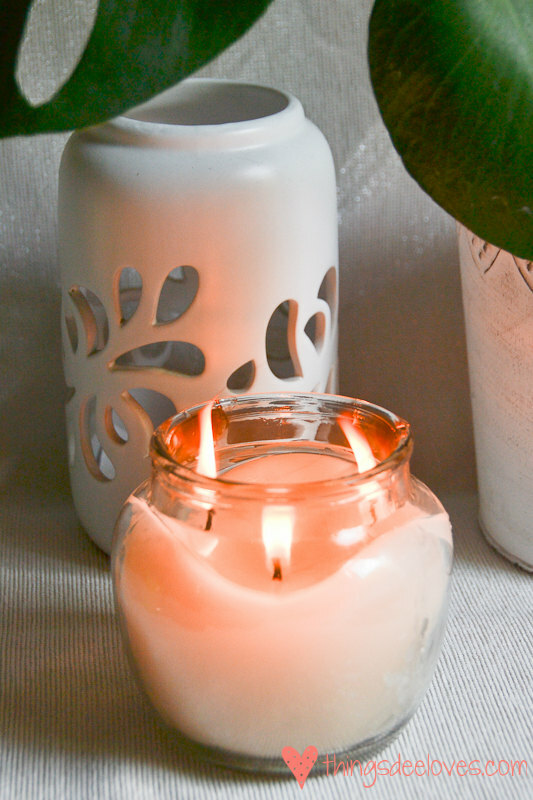 Once you have enough melted wax (you can melt a few candles at a time), add the citronella oil. You can use your discretion, depending on how strong you want the scent (I used about 1 teaspoon per cup of melted wax). Stir, and ladle the melted wax into the jars. Set aside to cool. I found that the wax contracted quite a lot once set, so you may want to keep some aside to top up the candles once they are cool. Let the candles to cure for 24 hours, then enjoy! wax is flammable (duh), so be very careful to not put the candles on direct heat. Heat slowly to melt. don’t place the wick too close to the edge of the glass jar, which will cause it to crack once lit. 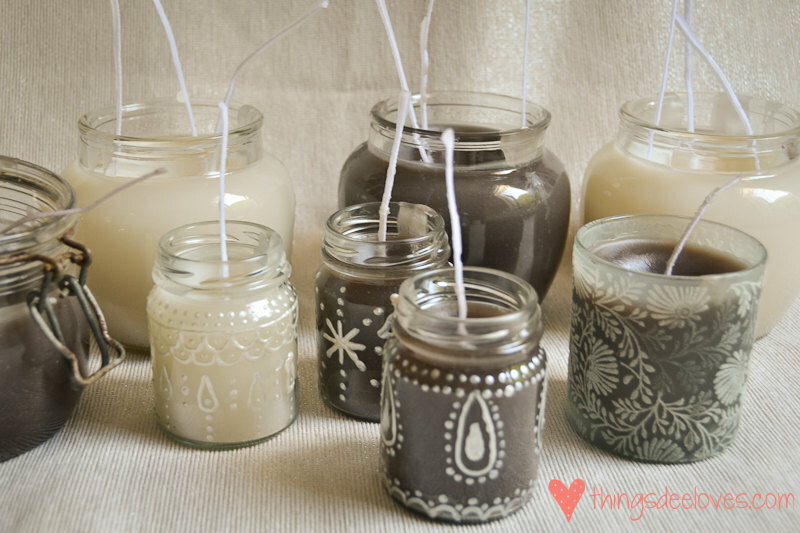 I got a lot of these tips from this great teacup candle tutorial by Zana – thanks ladies! PS: Please remember to pop over to the big red button on the right to vote for Things Dee Loves in the SA Blog Awards! This is sooooo awesome! The combination of decorated jars and candles is such a good idea! I often melt old wax to make new candles …. but never thought of filling decorated jars. Thanks for this beautiful idea! Thanks for the comment Karin, and enjoy your candle making!